Bucks AIR is now a part of Young Audiences Arts for Learning! 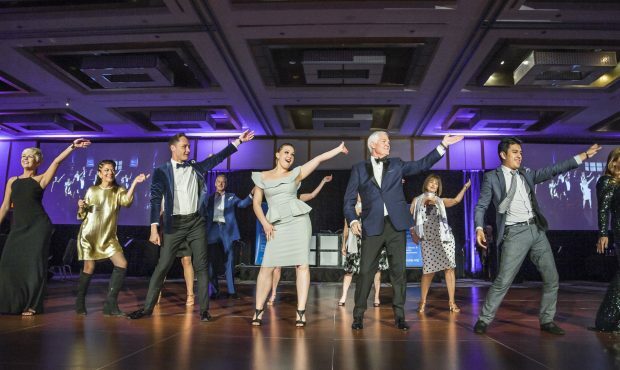 DAZZLE: MAD HOT BALLROOM Raises over $280,000 for Arts Education! Raises over $280,000 for Arts Education! 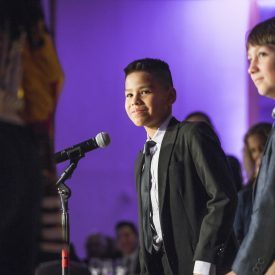 On Saturday, April 21, Young Audiences New Jersey & Eastern Pennsylvania (YA), the area’s largest arts education non-profit, celebrated with a special black-tie gala, Dazzle: Mad Hot Ballroom, A 45th Anniversary Celebration at the Princeton Hyatt. The benefit included performances by students working with YA teaching artists, and a dance competition a la “Dancing with the Stars” where VIP dancers were paired with professional dancers to win the Disco Ball Trophy! Dazzle: Mad Hot Ballroom raised over $280,000 and all donations will support YA in its mission to inspire young people and expand their learning through the arts. The generous donations included a Fund-A-Need Auction to support arts education scholarships. Donors exceeded a $50,000 challenge from The George and Estelle Sands Foundation, raising $101,000. In celebration of Young Audiences’ 45thanniversary, YA announced a $450,000 anniversary campaign to grow capacity to serve more students and to develop new and innovative programs that respond to unmet needs in schools. Thanks to Dazzle donors, the campaign is over half-way to the goal. From start to finish at this dazzling event, YA’s mission and passion for the arts was front and center. The gala was kicked off by YA teaching artists that united their voices and all those in the room to recite the Arts Advocacy Pledge written and led by slam poet Gayle Danley. Teaching artists Alice Leon and Seth Reichgott thanked gala sponsors with an original and comical song written by Leon, and Jacob Winterstein showed off his mad hot rhyming skills with an original poem welcoming guests. A highlight of the night, four VIP dancers, paired with professional dancers, competed for the disco ball trophy. VIP dancers includedJeannine Cimino (Berkshire Bank, Senior Vice President, Regional Operations Leader) Carol Golden (Attorney & Community Activist), Tom Sullivan (Princeton Partners, CEO), and Jeffrey M. Vega (President & CEO, Princeton Area Community Foundation). 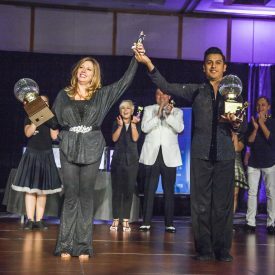 They all gave stellar dance performances and after a very close race, Jeannine Cimino and professional dance partner from Fred Astaire Dance Studio, Juan Ramirez, garnered the coveted prize (and bragging rights) dancing to the song “I Will Survive.”. “I decided to participate in YA’s Dazzle Mad Hot Ballroom because I wanted to do something completely outside my comfort zone while still contributing to my community in a meaningful way. I’m nervous and excited to start my dancing career,” shared Carol Golden. “At the Community Foundation, we are working to ensure that ALL KIDS THRIVE, and through my work, I’ve had the chance to see how YA partners with schools to make arts education accessible to all students. The arts play a vital role in enriching young lives, which is why I proudly will dance for the arts at Dazzle,” said Jeffrey Vega. Jeannine Cimino, Carol Golden, Tom Sullivan, and Jeffrey Vega join the ranks of Dazzle VIP dancers from the past five years including: Joanne Canady-Brown, Barbara Coe, Carol Cronheim, Chris Daggett, Denise Wood Darder, Sue Evans, Dan Fatton, Lew Gantwerk, D.A. Graham, Katie Hughes Redmond, Jill Jachera, Chris Long, Tamara Matteo, Bobby Mascia, Stacy Mattia, Jon McConaughy, Michele Minter, Mark Murphy, Jeff Perlman, Michele Siekerka and Bryce Thompson. Another exciting and inspiring part of the evening was the powerful performances by students from Eldridge Park Elementary School in Lawrence, NJ, Hedgepeth Williams Middle School for the Arts in Trenton, NJ and Cambridge Elementary School in Kendall Park, NJ who took the stage and shared their creativity in songwriting, poetry, video editing and theatre alongside YA’s extraordinary teaching artists. These bold and creative students brought the room to their feet with applause when they shared what they learned by participating in a YA residency program. For more information about Dazzle: Mad Hot Ballroom and to see pictures and performance videos from the evening go towww.DazzleYA.org. Dazzle: Mad Hot Ballroom receives additional support from generous corporate sponsors, including Berkshire Bank, M&T Bank, Princeton Area Community Foundation, Princeton Partners, Fred Astaire Dance Studio of Princeton, General Catalyst, PSE&G, Drinker Biddle, Mathematica Policy Research, Merrill Lynch, Michael Graves Design, New Jersey Manufacturers, NJBIA, NJM Insurance Group, NRG Energy, Robert Wood Johnson University Hospital, UBS Financial Services, Wells Fargo, Whistling Bird Creative, Borden Perlman, Entercom/WCBS, Investors Bank, jaZams, New Jersey Premier Outdoor Media, and Town Square Media/101.5 Radio. For partnership, corporate sponsorship opportunities and to be considered as a VIP dancer for YA’s Mad Hot Ballroom Gala in 2019, please contact Denyce Mylson at [email protected] or 609-243-9000 x202. Additional photos available upon request. Founded in 1973, Young Audiences New Jersey & Eastern Pennsylvania is the premier arts-in-education resource in the region, providing high-quality performances and artist-in-residence programs to schools in all 21 counties of New Jersey and the 7 easternmost counties of Pennsylvania. Young Audiences’ teaching artists represent all art forms—from dance and theater to music, language and visual arts. Since its founding, the organization has reached over 13 million children with essential arts education experiences. A not-for-profit organization, Young Audiences’ programs are accessible to all socio-economic, ethnic, cultural, and geographic communities, and are designed to strengthen the arts in schools, meet local and state curriculum standards, involve families in arts activities, and enrich cultural life in New Jersey and Pennsylvania communities. Young Audiences New Jersey & Eastern Pennsylvania is the first arts education organization designated as a major service organization by the New Jersey State Council on the Arts and, as part of the national network of Young Audiences, Inc., was awarded the National Medal of Arts by President Clinton. Young Audiences programs are made possible in part through a grant from the New Jersey State Council on the Arts/Department of State and Pennsylvania Council of the Arts. Additional funding comes from foundations, corporations and generous individuals. To learn more, visit www.yanjep.org. To be “social” with us, join us on Facebook, follow us on Twitter @YANJEPA and on Instagram @young_audiences_njepa. This entry was posted in Press, Press Releases on May 10, 2018 by Chris. Young Audiences' mission is to inspire young people and expand their learning through the arts. Young Audiences believes that all students deserve equal access to the arts and we strive to provide meaningful art experiences to young people regardless of cognitive or physical development, socio-economic status, or geographic location. © 2019 YANJEP. All Rights Reserved.